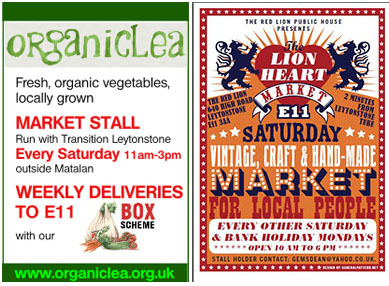 I’ve added a new Markets page for information about the Lion Heart Market and the Organiclea-Transition Leytonstone stall. I’ve also added a map to the Town Centre page. The site is constantly being updated and new content added, so keep your eye out for changes (I’ll let you know about the main ones)! If you have any suggestions for content, contact me through the Contact Form. This site is a free resource for Leytonstone, the more people who know about it and support it, and the more the content reflects what you want, the more everyone will benefit. Thank you.